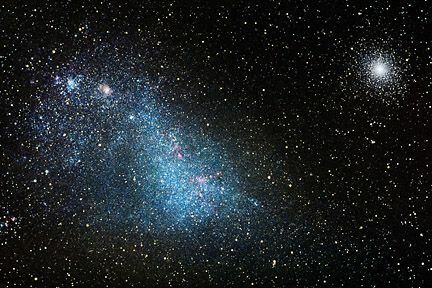 The Small Magellanic Cloud (SMC) is an irregular galaxy in orbit about our own Milky Way. At a distance of about 200,000 light years, it is one of the Milky Way's nearest neighbours. In fact, it is one of the most distant objects that can be seen with the naked eye. With a mean declination of approximately -72°S, it is best viewed from the Southern Hemisphere. It is located in the constellation of Tucana and appears as a hazy, light patch in the night sky about 3° across. It looks like a detached piece of the Milky Way. It forms a pair with the Large Magellanic Cloud (LMC), which is positioned a further 20° to the east. The Small Magellanic Cloud is a member of the LOCAL GROUP of galaxies. Since it has a very low surface brightness, it is best viewed from a dark site away from city lights. Today, the ability of the average backyard observer to gain access to sophisticated observing equipment has created exciting new possibilities for amateur astronomy. Innovations such as large aperture Dobsonian telescopes and moderately priced, yet highly sensitive CCD cameras, allow many amateurs to look for objects that are beyond those listed in the standard popular catalogs such as the NGC. The Internet now gives amateurs the ability to search many of the professional astronomy archives for lesser known, yet exciting, objects to attempt to observe. Many web sites now provide digests of this information in a form more suitable to the average amateur. However, with most of the world's amateur observers living in the Northern Hemisphere, not as much of this information is available at an amateur level for those who live in the Southern Hemisphere. Though it covers only the Small Magellanic Cloud itself, the purpose of this web site is to gather and present as much information on this interesting patch of sky as possible, in the hope that fellow amateur observers will have a reference source to aid their own observations. In creating this site I have used many references and I will attempt to cite them whenever possible. There is no definitive guide to the SMC and even this site is only a beginning to the wealth of interesting objects found within it. You will find here information regarding the history and science of the SMC, along with contributed observations and a review of some of the Atlases that will assist in observing the Small Cloud. A series of maps have also been included, these maps are taken from the Herald Bobroff Astroatlas. It is my hope that this web site will, over time, improve and grow. To this end, I call upon fellow observers to contribute to it, either in the form of your own personal observations or in other constructive feedback. A page this size requires many acknowledgements which are too numerous to list here.